I must be getting old as just before Christmas I needed my first pair of reading/sewing glasses. They needed a nice case so I used the tutorial over on Lilipopo's blog. She has some lovely embroidery patterns and they are a style that I find adorable....plus she lives in Cornwall. 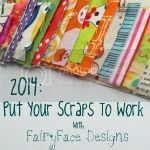 I used a tiny, tiny scrap of Liberty fabric for her dress and as Sarah is encouraging us to put our scraps to work this year then I am linking up at the end of the month. I'm also just in time to link up with Amy, who is hosting TGIFF this week. I hoped to have this finished by Friday but had a bit of the sniffles that I brought back from our Valentine trip to Bristol. Tim's Valentines card was found in a charity shop while hunting for vintage sheets. It's like a simplified game of Beetle. Although I have loads of WIP's .... I seem to have started another one! I didn't feel like concentrating on much last week and as my very thoughtful friend Karen had bought me this for Christmas I had another look through it. I love the travel quilt idea as we are always off out and about in Libby our little campervan, blogged at LibertyBlueVan. They are 2" diamonds and stitch up quite quickly. I've completed 3, but cut and basted quite a few more. Though these all look coordinated, as I've used the remains of a Moda Scrap Bag, I think the rest will be quite scrappy. I don't have many scraps, as some of you know, I've been swapping, buying, begging and borrowing scraps from everyone...can you borrow scraps??? I'm not sure. Anyway it's a great project as you can see below the selvedge gets turned under and the maths geek in me worked out that the minimum strip width, to give 1/4 inch seam, is 2.23".... Do you remember SOHCAHTOA? Years ago I found these in a charity shop and they are great for fussy cutting. The glasses case is SO sweet - well done! And thanks for linking up to TGIFF! Email me your address and I will send you a bag of scraps! The geek in me tells me ( woops probably shouldn't say, but I will..) The Old Arab Should Offer His Camel Another Hump... Yes, good old Trig! That was the name of the camel, right? That is the sweetest glasses case I've ever seen!! Beautiful! Your epp looks great and reminds me I've picked a project out of that book that i must get to work on! lovely glasses case :) I love the stitching on the hat. I also love that jigsaw game so cute! You are clearly good at charity shops those templates are great. Love the diamonds! Careful now ... it's addictive! scraps - send me your address, i will send scraps, what colours? Love the cute glasses case!